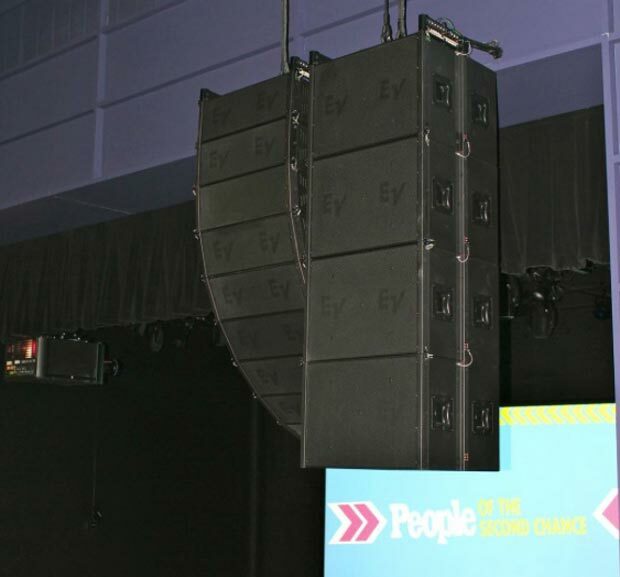 A few weeks ago, we had the opportunity to demo a new speaker system in our auditorium. Our existing PA is not great; well let me rephrase that. It’s a decent PA that is completely wrong for our room, and is installed wrong. Of the 12 boxes (6 per side), 8 of them are pointed at walls, not at people. That leads to a highly reverberant sound field (something you’ve heard me talk a lot about lately), with minimal direct sound. The end result is that it’s very hard to hear, and we need to run music a lot louder than we should to try to overcome the reverb. I spent a lot of time thinking about how to demonstrate the benefits of a proper system to our church’s leadership. I think this gets overlooked too often; and quite frankly, it’s a flaw in our thinking. As humans, we naturally tend to think everyone is like us. It’s a normal misconception. We assume that because we can obviously hear the difference between our old, crappy PA and the new great-sounding one, that everyone else will be able to as well. Bad news; it ain't necessarily so. Most speaker demos I’ve been to consist of a select group of carefully chosen tracks that make the proposed PA sound good. This is a valid test, but only for the engineers and musicians in the group. The average person will not likely be able to differentiate between differences in speaker systems—at least not on a conscious level. We played music on both our house system and new proposed one, and when I polled the audience, most of them said they really didn’t hear that much of a difference. Yes, the new one sounded a little more clear, but it wouldn’t have been enough to make the sale. One of the major issues we have in our room is comb filtering; in fact it’s so bad that we have 12-18 dB variations between 2-4K from seat to seat. I can hear the collective groan coming from you, my dear readers. However, when I explain that to our leadership, here’s what they hear, “Blah, blah, blah, blah, 12-18 blah, blah, blah, blah…” It means nothing to them. So we had to demonstrate it. I followed that up with an explanation of the implications of such varied listening experiences. But even that wasn’t enough. Next time, we’ll talk about using creating compelling demonstrations that even the non-audio person will hear and realize the benefits of. Today’s post is also brought to you by Bose Professional. Sound solutions from Bose Professional Systems Division provide places of worship with full, natural music and clear, intelligible speech. The custom designed systems blend easily into your designs. Hear the reviews of the new RoomMatch speakers and PowerMatch amplifiers.